AFTER the phenomenal successes of recent graduates of the British EBF support Sire & Dam Restricted Maiden races, which include last week’s Gr.1 Goodwood Cup winner STRADIVARIUS (Sea the Stars) and multiple Gr.1 winner CRACKSMAN (Frankel); the 2018 series kicks off tonight at Great Yarmouth. The program of races, designed to encourage two-year-old opportunities for horses with potential staying pedigrees, has gone from strength to strength following support from the industry and racecourses and the success of the horses that have used them as stepping-stones to progress their racing careers over the classic distances and beyond. 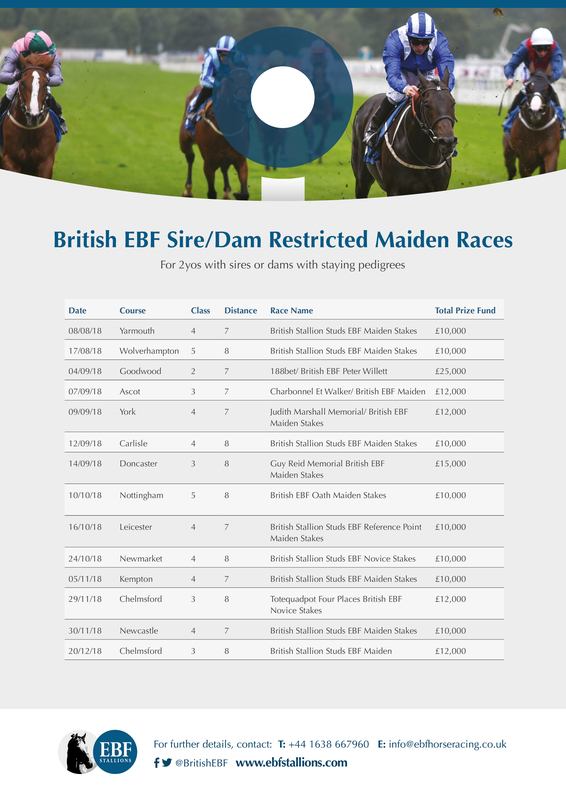 There are now 15 races in the program and the British EBF were delighted to use the opportunity of the launch race at Great Yarmouth today to announce the addition of a highly prized Sire and Dam Restricted Nursery Handicap at Newmarket on 24th October. The Class 2 contest over 10f will be worth £40,000 and will take pride of place alongside a Sire/ Dam Restricted Maiden on the same day, dedicated to two-year-olds, run over a mile. The Mick Channon-trained Caravela (11/1) captured the EBF Breeders’ Series Fillies’ Handicap under Andrea Atzeni, the sixth race on day two of the Qatar Goodwood Festival. The four-year-old daughter of Henrythenavigator launched a powerful challenge towards the outside of the field in the home straight and responded willingly to Atzeni’s urgings to score by a length and three-quarters from Roger Charlton’s Savaanah (4/1), who filled the runner-up position in the 10-furlong contest. Channon, registering his first victory at this year’s Qatar Goodwood Festival, commented: “Caravela won nicely today. We thought she had a chance and we are delighted she has won. “She is quite a valuable filly who is by Henrythenavigator and we think there is a bit more to come from her. “She hasn’t been the easiest horse to train and has had lots of niggles throughout her career. We’ve had to wait for her, but if they’re good you don’t mind waiting! “Getting black-type would be the plan for her now if we could take that route. 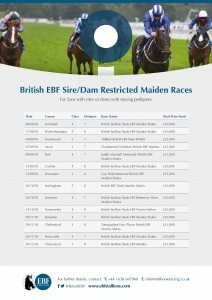 I think there is a final to this EBF Breeders’ Series so we will look at that. “It would be great to get black-type for her. In the last five or six months, she has been a pleasure to train and long may it last. “Hopefully, she keeps improving and we could have a go at a Group or Listed race with her. Atzeni rode Without Parole in today’s feature race, the G1 Qatar Sussex Stakes. Trained by John Gosden, the 7/4 favourite was forced to make most of the running and was unable to repel an array of challengers in the home straight, eventually trailing home in seventh behind 9/1 scorer Lightning Spear. The Italian rider commented: Discussing the race with John Gosden beforehand, it was clear that there was not going to be much pace on. “He had to make most of running and I didn’t really want to lead on him, but I had no choice. “When the rest of the field came to him. He did pick up nicely but faded late on. He is a horse who I think prefers to have something to aim at – he’s better than that as she showed at Ascot last time. One and three quarter lengths separated the first two home, with Caravela, an 11/1 chance trained by Mick Channon, coming out on top from the 4/1 Roger Charlton-trained Savaanah. Charlton commented on his three-year-old filly’s run: “I am pleased really – I thought she ran another solid race. “We beat the winner (Caravela) there, a sort of bloodless victory where the handicapper put us up four pounds. “I thought we would beat her again today, but Caravela has run very well, she has never been out of the places. The winner was rated 77 not that long ago and now she is in the 90s. Entries for a brand-new EBF novice race for two-year olds closes tomorrow (17th May 2018). The Class 3, British Stallion Studs EBF Novice Stakes will be staged at Great Yarmouth on 23rd May, which had a fantastic opening meeting earlier in the month with the likes of WITHOUT PAROLE (Frankel) making his seasonal reappearance, over six furlongs and carries at total prize fund of £15,000. The race has been specifically designed to attract potential Royal Ascot two-year olds; providing valuable racecourse experience for the juveniles ahead of progression to possible runs in races such as the Coventry or Albany Stakes (both Gr.2) by making use of the two-year-old friendly straight at Yarmouth. The race came in to being as a result of consultation between the BHA, Arena Racing Company and the British EBF and has been funded in part via the BEBF Development Fund. “The British EBF are always looking to improve graduating opportunities for EBF two-year-olds; after the success of the likes of HEARTACHE, HEADWAY, TAKE ME WTH YOU and SANTRY all progressing via EBF maiden/ novice races to win or be placed at the Royal meeting in 2017, the chance to further enhance this area of our portfolio was very attractive.